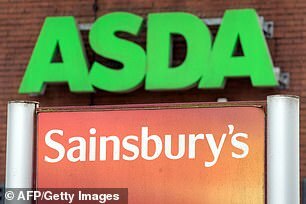 Asda and Sainsbury’s proposed £14billion merger is to be scrutinised by watchdogs for an additional two months. The Competition and Markets Authority has extended its deadline because it needs more time due to the deal’s complexity. It will deliver a final verdict on April 30 instead of March 5. Frozen food chain Iceland is believed to be considering making a grab for any stores the chains have to sell as part of the tie-up. Meanwhile, the former boss of Lidl’s UK business warned over the death of large out-of-town supermarkets. Ronny Gottschlich, who was Lidl UK’s managing director from 2000 to 2016, said the market is changing due to his old employer and fellow German discounter Aldi. Coupled with online shopping, he said it means fewer people will shop at what he called ‘big boxes’ in the future.